The photos below are from a trip to Yazd and Isfahan about a month ago. 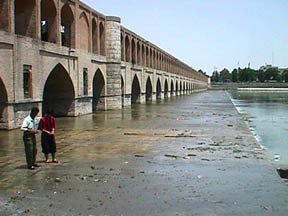 At the time Zayandehroud's water level in Isfahan was extremeley low. But the situation has gotten even worse. Iran is facing its worst drought in three decades. "A severe drought in 1999 followed by an extreme drought in 2000 has seriously affected 18 of the country's 28 provinces, mostly in southern, eastern and central Iran. Some 37 million people, over 50% of the country's population, are affected," according to a report by U.N. observers. To learn more about the drought and how you can help, go to Iran Forum's special page.